Fit Fluential Mom: One of THE BEST Strollers on the Market! 8) the option to place the car seat on the frame without having to have the regular stroller seat below it (as you have to do with the Chicco & Graco strollers) making them much heavier and bulkier. It's so comfortable, lightweight, easy to fold and unfold, has every feature you could possibly imagine and it retails for only about $200! That's no more than you'd pay for some of the cheapest travel system strollers on the market. Below is a description of the Atmosferra. If can be found on Stroller.com, as well as several other distributors including Babies R Us and Amazon. If you're looking for an all-around excellent all-purpose stroller, this is the one for you! The Mia Moda Atmosferra Stroller receives very high points across the board! 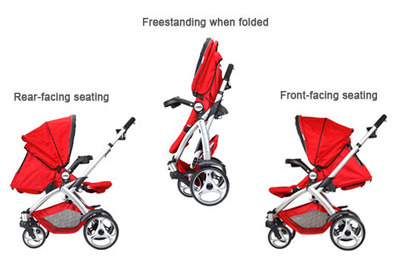 A feature that parents really like is the ability to switch the seat to face the front or rear of the stroller. So parents who like to keep an eye on, or have a lot of interaction with baby this is a wonderful feature. All-wheel suspension and swivel lockable front wheels makes for a smooth comfortable ride for baby, and very easy to push. The 3-position recline and adjustable calf support is comfortable for baby from birth and up. A full-coverage canopy, and removable child tray with cup holder is included. For parent’s convenience the handles are height adjustable, the stroller is freestanding when folded, and the stroller converts to a travel system with the Mia Moda Car Seat. This stroller includes even small details such as a parent cup holder, pocket on the back of the seat for small items, extra large storage basket and splash guards. Even with all of these exciting features reviewers noted some issues with the design. Parents found that they couldn’t close the stroller when the seat was in the rear-facing position. In addition, they found closing the stroller could be hard to do, finding it took at least two-steps to close it. It also was too heavy and did not fold compact as other types of strollers. Reviewers also noted the lack of a parent organizer. Overall reviewers found this stroller to meet and surpass their expectations, and if looking for a stroller with these features it is highly recommended. This stroller received 5 out of 5 stars.